Former world champion Alex Arthur believes Charlie Flynn will be "better suited to professional boxing" than the amateur ranks. 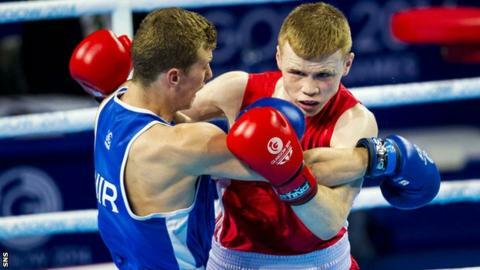 Flynn, 21, makes his pro debut against Ibar Ryaz on Sunday - four months after winning lightweight gold at the Commonwealth Games in Glasgow. And Arthur, who won Commonwealth gold in 1998, feels Flynn should make an impact in the paid ranks. "He's naturally very aggressive, he has great stamina," said Arthur. "He's also very adaptable as we saw in the Commonwealth Games coming up against a number of different opponents with different styles. "He also has the added advantage of having Peter Harrison as his coach, who coached me and his son Scott from amateur to professional boxing. Peter helps you make the transition very well so Charlie has all the advantages. "It's a massive transition to move from amateur boxing to professional and it's one that I'm sure Charlie's really looking forward to." Flynn defeated Northern Ireland's Joe FitzPatrick to claim gold in August and confirmed his move into the professional ranks last month. Arthur made his professional debut two years after his Commonwealth win in Kuala Lumpur and described the move from amateur to professional as "like starting all over". "Of course, it's the same sport; you're throwing punches with the same hands," he explained. "But everything changes - the time that the bout lasts and your opponents become very different. He's going to experience lots of different kinds of styles and guys who are in there to survive, guys who are trying to beat him. "Amateur boxing is so fast and intense and you try and gain so many points in the short time-span you have but in professional boxing you have a much longer distance to fight over so your tactics have to be entirely different."